Peat is being used since the 17th century, majorly as an energy fuel until a few years ago, and continues to be used across a number of application areas. Peat finds applications in the horticulture and agriculture sectors owing to its rich organic properties, providing excellent aeration and moisture when used with soil. However, rising environmental concerns and concerns related to commercial rate of extraction of peat have started to significantly diminish the growth opportunities of the overall market for peat across the globe. In Europe, which is the world’s leading consumer of the organic matter, the demand for peat has been sluggish over the years and continues to remain slow. Countries in the region that relied on peat as an energy fuel for their national energy demand have cut down on their peat consumption to more than 50% and are expected to further bring the volumes down in the near future. Transparency Market Research estimates that the Europe market for peat will exhibit a meagre 0.6% CAGR over the period between 2016 and 2024, generating a revenue opportunity of US$2.13 bn by 2024, only a slight rise from US$2.05 bn in 2015. In terms of type, the report segments the Europe peat market into sapric, hemic, and fibric. Of these, the segment of hemic peat dominated the Europe peat market in 2015, accounting for over 45% of the overall market. Hemic is a partially decomposed organic material and often has the look and feel of mature compost. Hemic material has rubbed fiber content of 17% to 40%. The segment is anticipated to retain its dominance over the report’s forecast period as well, owing to the vast usage of this variety of peat in horticulture and agriculture sectors. The segment of sapric peat closely followed hemic peat in 2015 and is expected to retain its position over the report’s forecast period as well, exhibiting a 0.5% CAGR from 2016 to 2024. The segment of fibric peat is expected to be the least promising product segment over the forecast period, exhibiting a mere 0.1% CAGR from 2016 to 2024. Fibric peat can replace many natural fibres in sustainable manner without having to produce fibre corps on agricultural land. Peat as a fibre helps conserve wood as a fibre for other uses. Fibric Peat possess many anti-bacterial properties, excellent moisture and tolerance. However, the increased inclination of consumers towards other alternatives is expected to drastically affect the overall consumption of fibric peat in Europe over the said period. In terms of volume, Finland is the largest producers and one of the leading consumers of peat in Europe as its geographical location and climatic conditions favor maximum peat production. Finland is expected to will continue its current consumption trend with a sluggish growth during the forecast period. The country has many power plants and central district heating boilers fueled with peat in addition to other substitutes as wood and biomass. Sweden, Germany, and Ireland are also key contributors of revenue to the Europe peat market, with Sweden possessing extensive peat resources that are expected to last hundreds of years when present production rates are considered. While most other countries possess low volumes of resources, the volume is considerably higher as compared to the usage pattern of present times in countries such as Latvia and Lithuania. Some of the leading companies operating in the Europe peat market are Bord na Mona, Klassmann Dielmann, Vapo Oy, Oulun Energia, and Neova Ab. Peat is also known as turf is a heterogeneous mixture made of incompletely decomposed plant remains, mainly sedges, grasses, reeds and mosses, formed when waterlogging and the exclusion of oxygen affect the natural processes of decay. It is a slow process, with the layer of peat increasing by an average rate calculated to be no more than 1mm (1/16in) depth per year. The peat land ecosystem is the most efficient carbon sink on the planet because peat land plants capture the CO2 which is naturally released from the peat. Demand for Peat is projected to have a sluggish growth in coming years considering the extensive concern over environmental issue, growth in renewables on a large scale and use of alternative substitutes such as wood fiber, coir, land fill biomass and green compost. Europe remains dominant in Peat market in terms of production and demand. Countries such as Ireland, Finland and Sweden are expected to be the key consumers of Peat. Peat is also used as a major constituent for horticulture industry. Governmental regulations and environmental concerns has remarkably affected the Peat market. This trend is anticipated to continue during the forecast period, and is therefore expected to unfavorably affect the market growth. This report analyzes and forecasts the market for Peat at Europe level. The market has been forecast based on revenue (US$ Mn) from 2016 to 2024, considering 2015 as the base year. The study includes drivers and restraints of the Europe Peat market. It also covers impact of these drivers and restraints on demand for Peat during the forecast period. The report also highlights opportunities in the Peat market in Europe. The report includes detailed value chain analysis, which provides a comprehensive view of the Europe Peat market. Porter’s Five Forces model for the Peat market has also been included to help understand the competitive landscape in the market. The study encompasses market attractiveness analysis, wherein end-users are benchmarked based on their market size, growth rate, and general attractiveness. 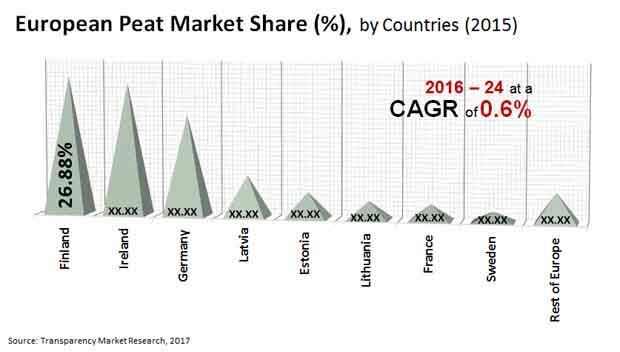 The study provides a decisive view of the Europe Peat market by segmenting it in terms of product type (Sapric, Hemic and Fibric) and applications such as power generation, agriculture, freshwater aquaria, water filtration, heating, horticulture and more). These segments have been analyzed based on present and future trends. Segmentation includes current and forecast demand for Peat in Europe. The report provides the actual market size of Peat for 2015 and estimated market size for 2016 with forecast for the next eight years. The Europe market size of Peat has been provided in terms of volume and revenue. Market volume has been defined in Thousand Metric Tons, while market revenue is in US$ Mn. Market numbers have been estimated based on product type and key applications of Peat. Market size and forecast for numerous end-users have been provided in terms of global, regional, and country level markets. Secondary research sources that are typically referred to include, but are not limited to company websites, annual reports, financial reports, investor presentations, SEC filings, CSA Global, Government database, internal and external proprietary databases, and relevant patent and regulatory databases such as ICIS, Hoover’s, oneSOURCE, Factiva and Bloomberg, national government documents, statistical databases, trade journals, market reports, news articles, press releases, and webcasts specific to companies operating in the market. The report comprises profiles of major companies operating in the Europe Peat market. The Europe Peat market is partially consolidated. Key players include Bord na Mona, Klassmann Dielmann, Vapo Oy, Oulun Energia, Neova Ab etc. Market players have been profiled in terms of attributes such as company overview, overall revenue, business strategies, and recent developments.